Often referred to as Castle Country, the northeast of Scotland is home to around a thousand castles and castle ruins, providing a wealth of history to explore. C&IT takes a look at the pick of Aberdeenshire's grandest castles for corporate entertainment. Fyvie Castle: One of the finest baronial castles in Scotland and often described as a palace, Fyvie dates back to the early 13th century. Set in 18th-century designed parklands with its own private loch, the castle is steeped in history, myth and legend. Just 30 minutes from Aberdeen Airport and 25 miles north of the city, Fyvie can host up 120 guests for dinner and up to 450 for drinks, while the large marquee area on the castle lawns allows for larger events during the summer months. 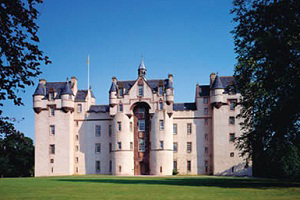 Crathes Castle: Its 300 acres of woodland provide an ideal playground for team-building exercises and challenges. The estate is home to northern Scotland’s only Go-Ape centre; a giant obstacle course in the trees, using ladders, walkways, bridges, rope and super strong wire. For a more relaxing incentive, the Castle also offers croquet instruction, whisky and treasure hunts, private tours and gala dinners in the Great Hall. Craigievar Castle: Like a fairy tale castle, Craigievar seems to have grown naturally out of the rolling hills and its great tower stands just as it did when completed in 1626. After two years of major conservation work, Craigievar Castle re-opened to the public in spring 2010 and is now available for exclusive private hire. Often described as the most loved castle in Scotland, it is a great option for smaller events, providing an intimate setting for groups of up to 50. Castle Fraser: A grand Renaissance castle, the foundations of which date from the 1300’s, Castle Fraser is a venue which lends itself well to corporate events and celebrations. The Great Hall, with its open fireplace and tall windows, can accommodate impressive banquets for up to 70 guests and receptions for 100. Outside in the castle’s grounds, the turreted exterior provides a backdrop for large marquee events or relaxed receptions in the walled garden or barbecues in the courtyard.